Scene setting: Renowned for her extravagant runway sets, Anya Hindmarch created an architectural version of a snowy mountaintop, with grid-like strips of snow sprinkled on an ascending catwalk, featuring a glowing triangle at its summit. ‘We had this idea of skeleton type clouds as well,’ Hindmarch explained backstage of the metal geometric white forms, which hung above the runway. Mood board: ‘The collection all started with a child’s purse,’ Hindmarch said of the folklore focused collection, which opened with a whimsical polar bear shaped bag hung as a necklace. Accessories and fur-collared coats came with leather details depicting hearts and butterflies, inspired by Scandinavian Kurbits folk art. 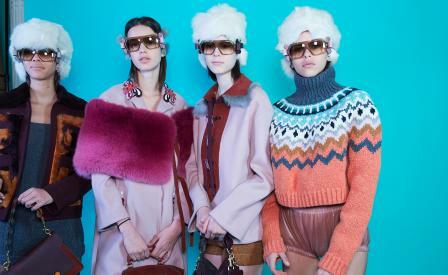 Beaded clogs, goggle-like sunglasses with fur straps and romantic cape silhouettes were blended with Hindmarch’s knockout humour-focused motifs, from smiley face backpacks to fried egg fur sliders.